One afternoon while browsing the interior design section of my local bookstore, I came across a book entitled Altar Your Space. I picked it up, looked at the lush photographs and read bits and pieces. Although I put the book back on the shelf, the title has stayed with me and whenever I go to that store, I look for it again. The book isn’t a how-to book about creating altars. It’s about creating sacred living environments, about intentionally infusing your living environment with the sacred. Interestingly, the room-by-room discussion does not include the kitchen. Given that the kitchen is my favorite room in a house, I find this omission rather perplexing. 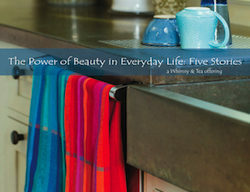 If you were to bring a sense of sacredness to your kitchen, what would that look like? First, a few words about the kitchen. There’s a reason why people tend to gather in a kitchen at parties, even when food and beverages are also served in the living room and/or dining room. There’s a reason I often prefer to work at the kitchen table rather than at my desk. The kitchen, where cooking once happened over a central hearth, is the soul of the house. It is a place of nourishment, both physical and emotional. It is where food is prepared and shared. More causal than a dining room, the kitchen can have a sense of intimacy. It’s a place to talk over the events of the day while chopping vegetables or while eating dinner. Altaring your kitchen means bringing an intentionality to this room — to recognize and honor the kitchen for its unique function in a house and in daily living and to infuse that with sacredness. For me, an altar brings back fond memories of helping my mother prepare the altar at St. Paul’s Church, the church we attended in the foothills of the Himalayas. I particularly remember covering the communion chalice with heavy, embellished cloths, the color of which depended on where we were in the liturgical year. When a customer tells me she plans to use one of my handwoven towels as an altar cloth, I imagine it laid out on a flat surface, maybe with flowers, candles and spiritually significant items. As I ponder this question of sacredness in the kitchen, a different image comes to mind. If the kitchen is indeed a sacred place, an altar cloth might take the form of a beautiful towel, not laid out on a counter where there’s already so much going on, but used for drying hands and dishes. I weave kitchen towels because I believe in the sacredness of the kitchen. It is my way of honoring cooking as a holy act. It is my hope that the towels I weave will bring beauty and sacredness to those who want to “altar their space,” be it the kitchen or another room. My invitation to you: What’s one thing you do to bring sacredness into your kitchen? I’d love to hear.